Available in a range of capacities and readabilities, Adam's bench scales offer sturdy stainless steel weighing pans and durable plastic housing for withstanding rigorous use in commercial warehouse environments. Bench scales are compact, versatile weighing machines that include a display, keypad and platform in self-contained housing. They are often used in inventory control and stocktaking procedures and are designed to fit on worktops and benches. Bench scales often include a wide variety of weighing functions including parts counting, checkweighing and percentage weighing for making inventory control, packing processes and quality control procedures more manageable. Adam bench scales are tried and tested products that can be used to check weigh or count anything from small screws and large parts in manufacturing and engineering to packaged food products. Several of our bench scale models feature NMI trade approved approvals for buying and selling goods by weight; whilst price computing scales are used for direct selling, bench scales can be used by business owners to certify the weight of finished products such as packaged food products and cosmetics that have a weight specified on the product label. The durable CBC bench counting scale is designed for demanding industrial counting tasks. 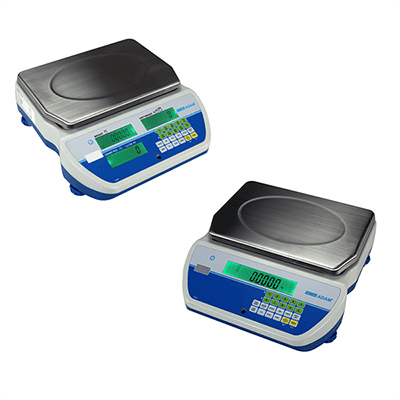 The CBD dual bench counting scale delivers a flexible and robust solution for companies that perform both small and large counting tasks. Achieve Increased counting capability by connecting the CBD to a remote platform. A tried and tested product for industry checkweighing applications, the CBK checkweighing bench scale is ideal for checking the weight of tools, screws and products in manufacturing and engineering. Adam GBK and GBK-M checkweighing scales provide heavy-duty durability and speed for completing industrial warehouse tasks with minimal effort. The LBK bench weighing scale is a compact, portable weighing machine that takes up minimal bench space yet. Warrior water-resistant weighing scales are constructed from a durable IP66-rated stainless steel base and sealed weight indicator for high-performance weighing, checkweighing and parts counting applications. The WBW water-resistant commercial scale features IP66-rated washdown housing and a large, easy-to-clean stainless steel weighing pan for significant protection against water and dust. Latitude compact bench scales provide excellent value for money, delivering fast, accurate checkweighing and parts counting for warehouse applications.